Are We Stressed Or Not? There are many a times we may feel that we are stressed and there are times we may be relaxed. However, it does not necessarily mean that we are not stressed when we think we are relaxed. Also the reverse is not true. We may be having an adverse situation but we could be coping well and actually not have stress. There are also signs of slowly building up stress also called, ‘creeping stress’. Sometimes, it goes on for months and builds up into a disease or behavioral issue. We can also have a situation where we get so used to stress that it becomes part of our ‘normal’ life. This is the most dangerous form as we think everything is fine whereas the body is completely stressed. The symptoms of an immediate stressful situation are instantly noticeable and can also be realized by the individual during or immediately after the event. Examples are a conflict, anger, anxiety, fear etc. These feelings and emotions also visibly subside as soon as the event is over. However, the impact of stress caused due to these feelings linger on from a few hours to a few days. We do not realize this but the way the body’s mechanism works is very simple; stress sets in almost instantly in terms of the physiological response but recedes slowly. Sometimes it does not recede if you do not stop thinking about it. However, the symptoms of slowly creeping and prolonged stress are less visible. In fact, an individual may not even realize that he or she is undergoing prolonged periods of stress because they get so used to it that it even becomes a ‘comfort zone’ for them. This can go on for months or years and suddenly one wonders why were they afflicted with some disease even though they had an apparently normal or healthy lifestyle. The desire to have just that little more alcohol at times or that gradual reduction in sleep, increase in beverages, propensity to get more irritable or just a little bit more angry (and defending it by telling yourself how exasperating the world is), are some of the signs of creeping stress. Another important cause and result of stress is so called, ‘perfectionism’ and having ‘high standards’. Anyone driving themselves or others on this path is causing a lot of genuine stress to themselves as well as to others. In short, anything adverse or different from what you were (or what you were doing before) and what you are now (or doing now) are indicators of chronic stress. The symptoms of stress are felt at various levels. We need to be consciously aware to identify them in different areas of life. Some of these are given below to understand what is happening. Sensations are the feelings we sense inside the body and internal physical discomfort. Some of these are increased heart rate, headaches, nausea, aches and pain, tremors, fainting, numbness, dry mouth, stomach cramps, excess sweating, indigestion, frequent urination and palpitations. These are internal feelings which take deep roots and trouble us a lot. These are represented by statements like, “I must do well”, “Life should not be like this”, “I must have what I want”, “This is terrible, I cannot take this any longer”, “Everyone should like me”, “I feel betrayed”, “I have to get back”, and many more like these. The body also gives obvious physical signs which need to be paid attention to. Some of these are getting fatigued faster, feeling of lethargy, getting more injury prone, greater propensity for inflammations, pulls and sprains while doing the same level of activities as before. Of course this may not hold true for a large age gap. One cannot be at the same physical levels at sixty as at forty or twenty, but if these symptoms are seen at say, thirty five, but were not there when you were thirty three, then it could be stress. Some of the health indicators are also signs of stress; increased frequency of colds, coughs, fever, flu, allergies and gastrointestinal problems. Yet others are high blood pressure, fatigue, heart problems, decreased sexual activity and lower immunity. Adverse changes in eating and drinking patterns indicate stress. Examples are overeating, under eating, anorexia, bulimia, binge eating or ‘mood eating’, loss of appetite, increase in tea and coffee, increase in alcohol intake, resorting to prescription drugs, smoking or other psychotropic substances. Changes in behavior, even for short durations are sure signs of stress. These could be avoidance issues, sleep problems, insomnia, time management issues, irritability, restlessness, speech problems and becoming accident prone due to lack of attention or awareness. Personal grooming may suffer or conversely, one may fret excessively over grooming and how they look. Getting bored frequently is also a definite sign of stress. Emotional issues which surface tell us if we are stressed. These are also definite signs of stress and not of any disease. Some of these are frequent bouts of anxiety or depression (however mild), anger, guilt, shame, embarrassment, feeling hurt, jealousy, ‘feel like dying’, ‘feel like crying’, becoming moody, a feeling of emptiness, aggression, feeling of worthlessness and boredom. Most of the stress related symptoms emerge at the workplace. Becoming suspicious, withdrawn, gossiping, aggressive, bossy, unable to focus on work, missing your own work plans on a more frequent basis, staying at work for longer hours, feel like running away from work, etc. are all signs of stress. Interpersonal issues are at the forefront of stress. It is not that these issues give us stress. It is the other way around. Stress is the cause for interpersonal issues. Some of these could be; becoming more passive or more aggressive, more introvert or more extrovert, become a loner and timid and withdrawn or become unduly competitive, gossiping increases, becoming manipulative or secretive. In short any interpersonal behavior which is not ‘you’ and you start exhibiting, is due to stress. At times positive changes occur due to a conscious effort and make you feel better. Such efforts should not be confused with stress. So we can see that if we are aware, we can figure out if we are going through stress. 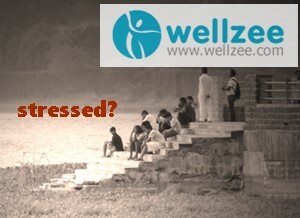 If you need more help than you can write to us or take one of our wellzee stress management programs.